Forget those old-fashioned wires-and-metal brackets and years of orthodontist appointments! Now you can have aligners that gently guide your teeth into alignment in less time and are virtually invisible while you’re wearing them. As an extensively trained cosmetic dentist, Dr. Arash Azarbal is trained in the use of Invisalign® invisible braces. Invisalign® is a seroes of clear plastic aligners that guide your teeth into position and can be removed for eating, drinking, and cleaning your teeth. No more restricted diets or worrying about food caught in wires that are difficult to clean. Because Invisalign® aligners are customized for each patient, they gradually move teeth into the correct position, eliminating the need for uncomfortable adjustments and maintenance. At the initial consultation, Dr. Azarbal will examine the overall health of your teeth and the amount of misalignment, including crowding, overbite, underbite, crossbite, gaps, and other common issues. This will include a set of x-rays to determine the best treatment and whether Invisalign® is right for you. If so, detailed molds of your teeth are made. A computer scans the molds to create a digital image of the teeth. Dr. Azarbal then uses the computer to plan how the teeth should move into position. A set of digitized images are developed that will be used to manufacture a set of customized plastic aligners. When each aligner is first inserted, it will feel snug. This is normal, as it is designed to move the teeth into a slightly different position. After two weeks, that aligner is taken out and the next one inserted. As treatment progresses through the complete set of aligners, your teeth will gradually move into the correct position. Because the custom-made aligners are so precise, Invisalign® doesn’t over- or under-correct. Traditional braces require numerous adjustments to get the teeth into position. Thus, the computer-designed aligners can achieve correct tooth alignment in a much shorter time. If your teenager has crooked, crowded, or otherwise misaligned teeth, there is an innovative new option to help improve the look of his or her smile. Invisalign® Teen is made by the same company as Invisalign® and offers a way for younger patients to achieve their cosmetic and functional dental goals. Designed to provide a faster, more comfortable, and more discreet teeth straightening experience than traditional braces, Invisalign® Teen is made specifically with the needs and goals of teens in mind. Dr. Azarbal offers this revolutionary system right here at our office. He can determine if this method is appropriate for your child during your initial consultation. Invisalign® Teen, just like original Invisalign®, is an orthodontic treatment that can straighten teeth and correct a number of dental concerns. Using a series of clear, removable aligner trays, this method will gradually alter the position of the teeth to achieve a more aesthetically appealing and functional alignment. Unlike traditional braces, no metal brackets or wires are used. As a result, teens can improve their smile discreetly and more comfortably than ever. Furthermore, they won’t have to worry about having “metal mouth” for pictures or avoiding foods that they love. The aligner trays can be removed to brush, floss, eat, and drink, but they should be worn at all other times. Each tray should be worn for approximately two weeks before being replaced by the next tray in the series. In general, the process should take between 9-15 months, though your teen’s experience may vary. To help you determine if Invisalign® or Invisalign® Teen is right for you, we have provided some answers to common questions. If your question is not addressed below, of if you would like to schedule a consultation, please contact our skilled team today. Who Is a Candidate for Invisalign® and Invisalign® Teen? Invisalign® and Invisalign® Teen aren’t appropriate for everyone. They may not work in cases of severe misalignment. Because the aligners are removable, some patients have had issues with compliance. Although they can and should be removed for eating and brushing, the aligners must be worn all other times in order to achieve the desired result. The most important factor in determining if Invisalign® Teen will be a good choice for a young person is whether they can follow the instructions for regular use. Invisalign® Teen must be worn consistently, as directed, and only removed to brush, floss, eat, or drink. If the aligners are worn less often, treatment times may be extended and the outcome affected. Invisalign® Teen can correct a broad array of aesthetic dental concerns, including crowding, overbite, underbite, crossbite, gaps, and other common issues. However, some cases may be better addressed with an alternative technique. Dr. Azarbal can determine if Invisalign® Teen or another method is right for your child during your initial appointment. Your individual dental needs will determine how long treatment will last. It’s also important to wear your aligners as often as recommended to avoid delaying the final outcome. Most patients are able to complete the teeth-straightening process in about 9-15 months. We will provide an estimate based on your characteristics and goals during your initial consultation. This may vary based on how often you are wearing your aligners each day. How long should I wear the aligners? One of the great things about Invisalign® aligners is the fact they are removable. However, your aligners should be worn as much as possible. You should be wearing your trays whenever you are not eating, drinking, brushing your teeth, or flossing. In general, we recommend wearing the aligners for about 22 hours per day—more if possible. This will help you complete treatment on schedule and potentially early. How do I keep the aligners clean? Taking good care of your Invisalign® aligners is very important, and fortunately it’s easy to do. When you remove the trays to eat, we recommend simply rinsing them in regular room temperature or cold water after removing them and before putting them back in your mouth. You can also brush your aligner with toothpaste, as you would your teeth, once at night at the same time as your teeth. Do not run your aligners under hot water, as this can distort their shape. For more tips on keeping your Invisalign® trays looking and functioning their best, talk to our friendly and knowledgeable team. 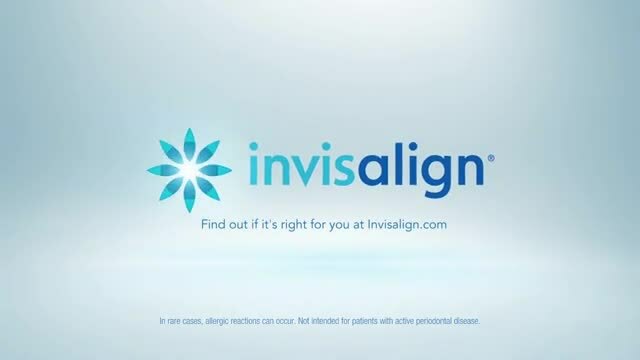 If you are interested in Invisalign®, contact us to schedule an appointment for an exam. If you would like to meet Dr. Azarbal and spend five or ten minutes learning more about this treatment, request a complimentary consultation. Call us or request an appointment online.